It's Blog of the Week time again. This week Zoe has agreed to walk us through The Zeitgeist of Zoe. I started this blog back in 2011 when my previous blog was hacked and was no longer a safe place for me to post. I have been blogging on and off since 2005, though the last few years has it been focused on Filofax and my quest for the perfect day planning system. I started to blog in general for several reasons. Primarily because writing is my passion and a blog seemed like the best venue in which to express myself. But also, inspired by the rest of the Filofax community, I started this particular blog to share the trials and tribulations of the journey to planner Nirvana. A post from 2011 called The Great Wallet Experiment, in which I attempted to use a pocket Filofax as a stand alone wallet, in addition to my regular personal planning Filo. The experiment ultimately failed, but this post got a huge amount of hits. One entitled The Tao of Filofax because, while I can't meditate to save my own life, dubbing around with my planner IS my way of meditating. I remember being so excited as I wrote that post...because it was the point that I stopped beating myself up for changing my system so much and gave myself permission to just relax and focus on the process of finding the perfect planner, not the end result...and I just couldn't wait to share that epiphany! How awesome this community is. I mean, I knew that...but since starting this blog I have really seen (and been blown away by) how so many different people, from all walks of life and from different parts of the world, can be drawn together and become so close. I'm also frankly amazed that so many people seem to enjoy my ramblings! A work in progress. It is not as eloquent as some, nor as focused and helpful as others. I don't post as much as I'd like and I often get carried away with non-technical aspects of planners/planning. But it's evolving, and I hope you'll all stick with me and see where the blog ends up! To just do it (if I may borrow a slogan). There aren't now and never will be too many Filofax blogs out there, so put one up! Share your system! Talk about your process! Show us your photos of it! People ARE interested and want to know. Plus, it's honestly a lot of fun. My thanks to Zoe for participating. 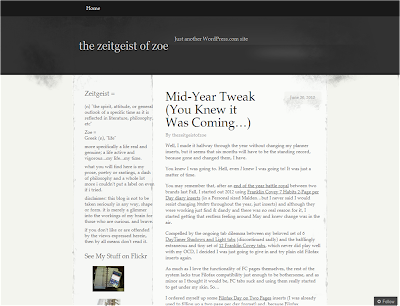 I've always enjoyed reading Zoe's blog. Her writing style makes it a reading pleasure. Learning that writing is her passion explains a lot of things. It shows in her writing.